#1 – Diamond shapes other that Round Brilliant Cut diamonds are difficult to buy “sight unseen”, such as buying fancy shape diamonds on the Internet. It is getting easier to buy diamonds on the Internet because there are now some diamond grading reports becoming available that will give a Cut grade based on light performance of the diamond. These reports are most notably available from the American Gem Society’s lab, AGSL. It is also helpful if you are able to see a photo of the actual diamond that you are considering. 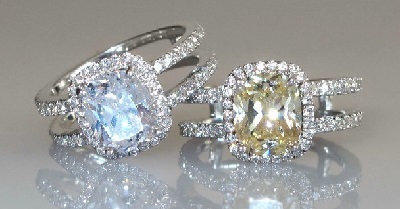 The online seller should have a return policy if the diamond turns out to be not what you had expected. #2 – Fancy shapes present some “challenges” that you don’t have with Round Brilliant Cut diamonds. – From a jewelry design and manufacturing standpoint…. it is always much easier to work with Round Brilliant Cut diamonds. – Some diamond shapes go in and out of popularity. In the future, if you want to sell your fancy shape diamond, or use it as a “trade in”, and that particular diamond shape that you have isn’t in demand at that time, it will be more difficult to get a lot of $ for it. #3 – Some shapes can present durability problems. The points on Pear Shape or Marquise Cut diamonds, or the corners on a Princess Cut diamonds… have all been known the chip or break if they are not protected properly in the setting. Again, the girdle in these areas should be just thick enough to help give the diamond protection and the head that hold the diamond onto the piece of jewelry must also protect the diamond. Once you have some info on diamonds that are available locally you can check online to see how the pricing will compare. Obviously, buying diamonds online is much different. On the online diamond retailer’s website you can plug in the information about the diamond you are looking for and the search engine comes up with available diamonds. Input the info of the diamonds that you just saw at your local jeweler and see what similar stones would cost over the internet. – you have reviewed the pages on the 4Cs and diamond grading reports…. – you have actually looked at diamonds (along with looking at them under the microscope!) at a local jewelry store and have a good idea of what the 4Cs actually are and you should have looked at grading reports for the diamonds…. – you have gone online and seen the qualities and pricing of what is available…. At this point, in the process you should have a very clear idea of an extremely important consideration in buying your diamond…. Where do we go from here ? ? ? Diamonds are diamonds, so the information about the 4Cs is generic…. it doesn’t matter the audience. When it comes to actually buying diamonds, it does matter who will buy the diamond…. there is a difference in the information needed. Now ladies, I don’t want to sound sexist here, but I do feel that the guys just need a bit more help to get through this process of buying diamonds! Do check back here in a while and I will update this page when I am free to write the content up. Cheers!